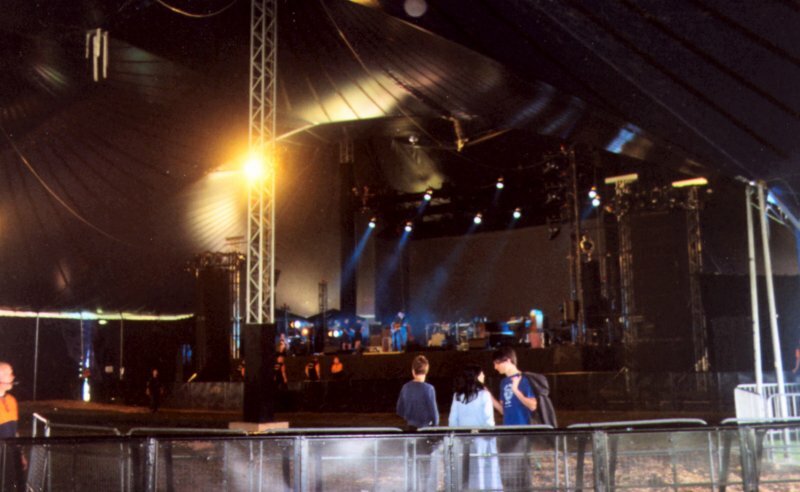 In 2000 Radiohead became the first major band to undertake a European tour in a tented structure. The Kayam structure is available exclusively in Europe from Atticbest Ltd and from Rudi Enos Design world wide. The tour used three Kayam structures and took place during the petrol strikes of that year. The Kayam crew were as always, magnificent - thank lads! 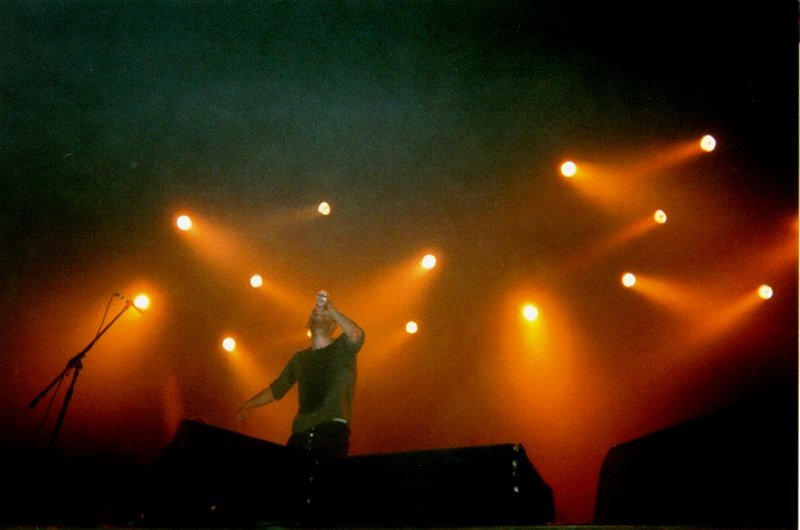 In September and October 2000 for the first time a chart topping, market leading rock group undertook a 21 date sell out tour using no traditional venues, i.e. 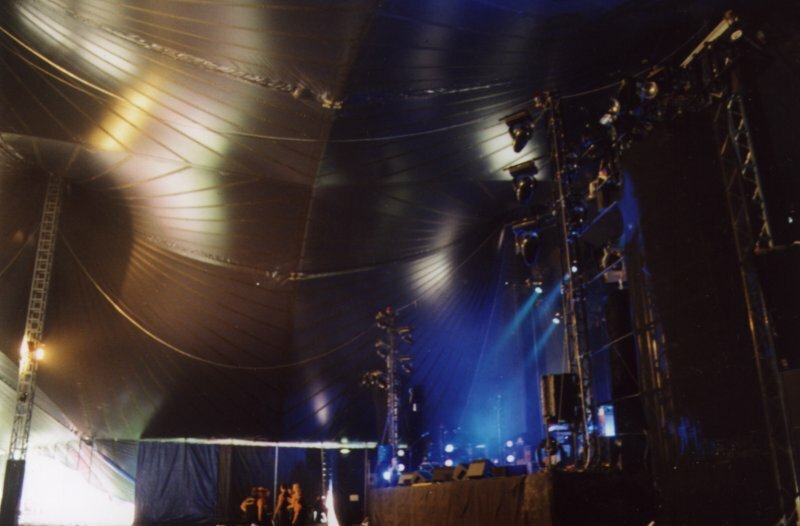 a portable structure the Kayam Concert Tent. 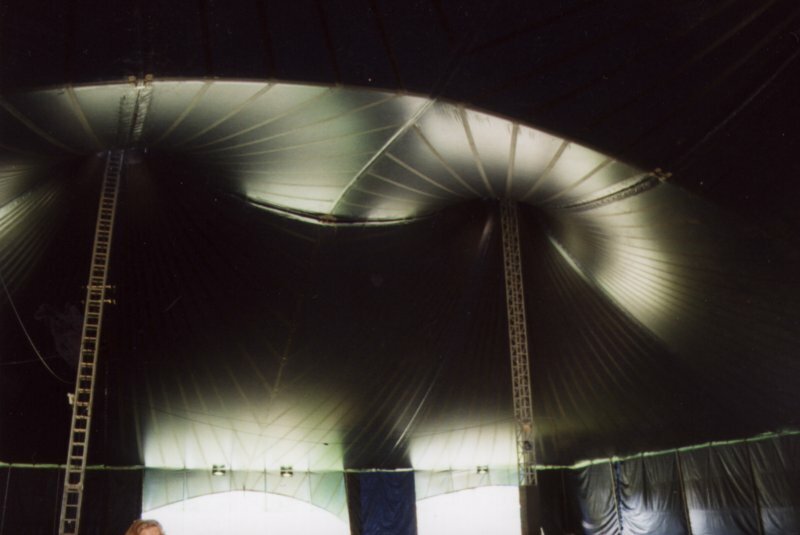 The band used the Kayam after performing in the structure on two previous occasions in Wales and Manchester. 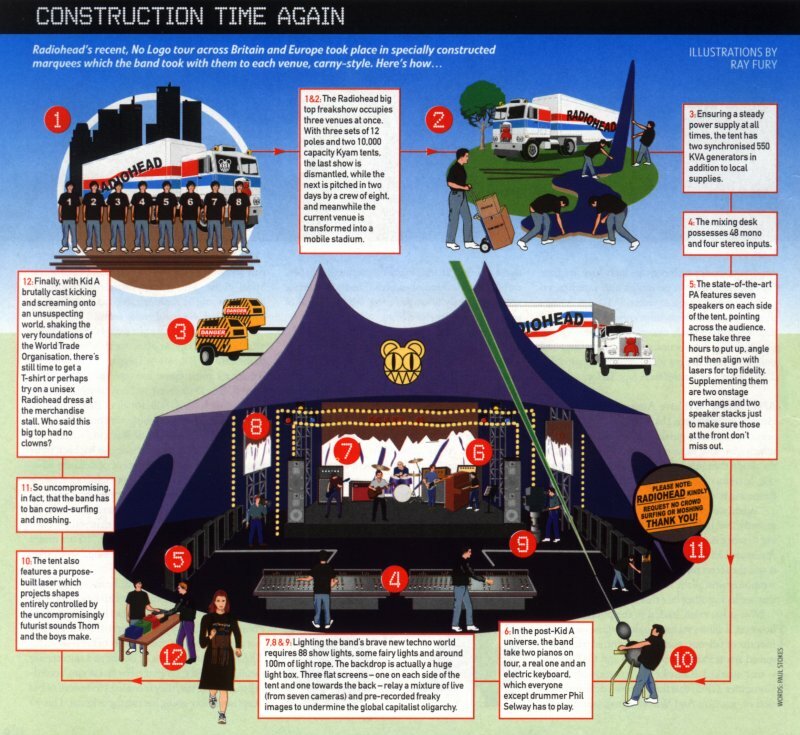 With a capacity of 10,000, the concert tent version of the structure was perfect for the tour. The band have been publicly appreciative of the use of this unusual venue, which was called the 'Magic Kingdom' by one journalist. "As for the tours, Jonny said that they are bringing along their own tent because they don't want to play in big venues that are designed for sport and have adverts all over the place. There will also be better sound and more control over acoustics. 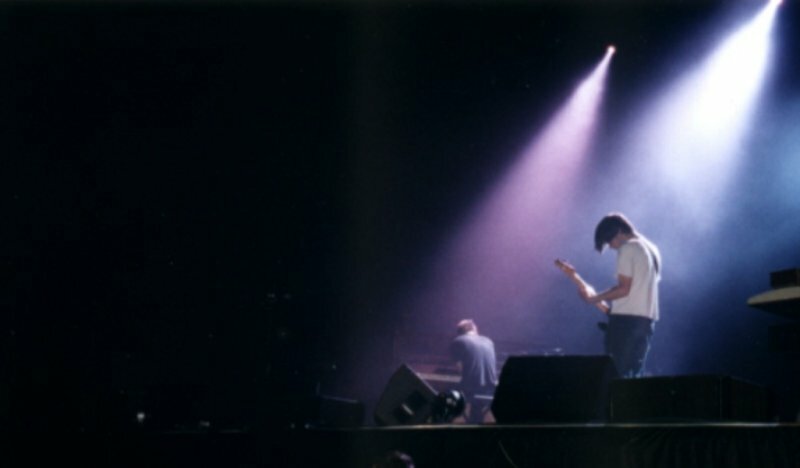 And as for why they are not playing Pinkpop, Colin said that they played Glastonbury before the release of OK Computer and don't want to play big festivals before the release of the album this time. Radiohead is in for a bracing jolt of culture shock when it plays the corporate, signage-strewn confines of the Air Canada Centre next month. " After a summer of outdoor gigging in Europe, the critically acclaimed Oxford quintet has spent the past two weeks touring Britain in a custom-made, sponsorship-free, 10,000-seat tent. The initiative, incidentally, was inspired by No Logo, Toronto writer Naomi Klein's best selling treatise on the ills of global branding. 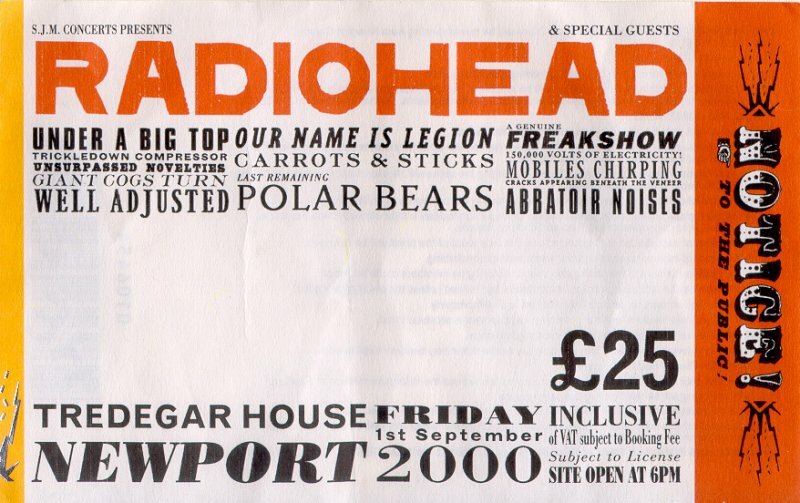 "It's been kind of frustrating because we've arrived at venues in Europe and there's been adverts on beer cups and lorries being parked behind tents with big adverts on them,'' explained band member Jonny Greenwood during a phone interview yesterday. 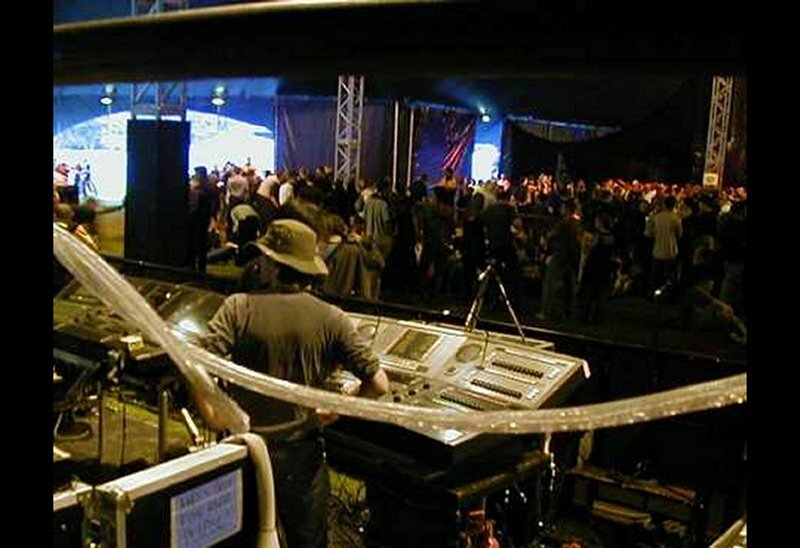 ''Being in control of your own venue you can do what you want. 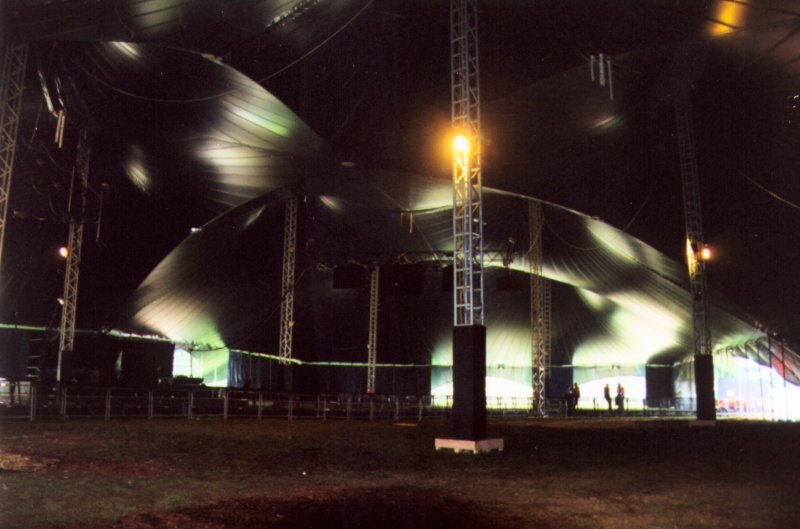 And (the tent) sounds better than a sports arena." In one of his diary entries earlier this year, O'Brien urged Radiohead fans to buy No Logo, a book by the Canadian journalist Naomi Klein. A brilliant analysis of the branding of planet Earth by Nike, McDonald's, Starbucks, MTV and others - and of the activists around the world who are trying to throw spanners in the works - No Logo was read by three members of the band and was even rumoured to be a potential title for the new album. "No Logo gave one real hope," says O'Brien. "It certainly made me feel less alone. I must admit I'm deeply pessimistic about humanity, and she writing everything that I was trying to make sense of in my head. It was very uplifting." "It was very Disney, you could see the lights twinkling away as you walk across the park." So you control the sound and you control the whole thing? "Yeah we control everything."